As part of an ongoing commitment to incorporating environmentally friendly practices and materials at its properties, The Rosenblum Companies is integrating sustainable decorative wall tiles developed by biomaterials company Ecovative Design into its workplace environments. In lieu of traditional artwork, mushroom-based sustainable tiles have been installed at the company’s Great Oaks Office Park. The Rosenblum Cos. is the first commercial property owner to feature Ecovative’s unique MycoBoard and MycoFoam wall tiles, incorporating large scale arrangements of “Weave Tile” designed by Harry Allen of Harry Allen Design NYC in the main lobbies of all three buildings at Great Oaks Office Park, as well as “Sinewave” designed by Ken Lush of Ecovative, and brightly colored, whimsical “QuarterTurns” designed by Jeff Betts, also of Ecovative, in newly renovated tenant lounges. Ecovative’s “Weave Tiles” on display in the lobby of 100 Great Oaks Boulevard. Ecovative, the pioneer and now world leader in mycelium-based materials, developed the MycoBoard panels and MycoFoam material as a high-quality, healthy, sustainable alternative to traditional, typically synthetic-based products. In 2016, the company expanded its use of the “grown” biomaterial technology to include highly innovative wall design installations, as well as biofabricated furniture. Ecovative’s Mushroom Materials are Cradle to Cradle Gold Certified and Red List Free, meeting the function and sustainability needs of the commercial, architecture and design communities. “Rosenblum is leading by example by focusing on quality and sustainability, with a corresponding concern to create a healthy environment for its tenants,” said Eben Bayer, Ecovative Design co-founder and CEO. 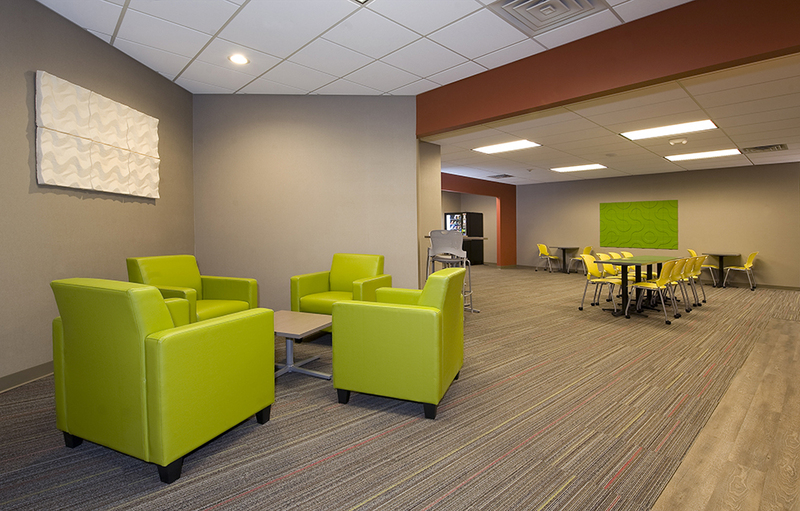 “Sinewave” and “Quarter Turn” on display in the tenant lounge at 100 Great Oaks Boulevard. Other recent “green” improvements that The Rosenblum Companies has made at Great Oaks Office Park include new 100% recyclable solar-reflective roofs and low profile, energy efficient LED lighting for parking lots and common areas. Rosenblum is one of only two private commercial property owners in the Capital Region to achieve ENERGY STAR certification for five or more buildings, and in 2015 was awarded both the Town of Guilderland “Green Award” and the TOBY (“The Office Building of the Year”) “Earth Award” by the Building Owners and Managers Association (BOMA). In February, The Stakeholders, Inc., a not-for-profit organization that inspires and equips people to take positive action in their communities, announced it had selected Rosenblum as the organization’s 2017 Community IMPACT Award recipient in the “Sustainable Communities” category. The Sustainable Communities IMPACT Award recognizes an individual, business or group project for demonstrating leadership or innovation in programs or principles that advance sustainability and environmental stewardship in the community. Rosenblum was nominated for the IMPACT award by Ecovative. The new Ecovative wall tiles are part of a $1 million+ common area upgrade program currently underway in the three buildings that comprise Great Oaks Office Park. Entry vestibules, lobbies, corridors, restrooms and lunchrooms will be completely remodeled, and new access control and IP security camera systems installed by early 2017. 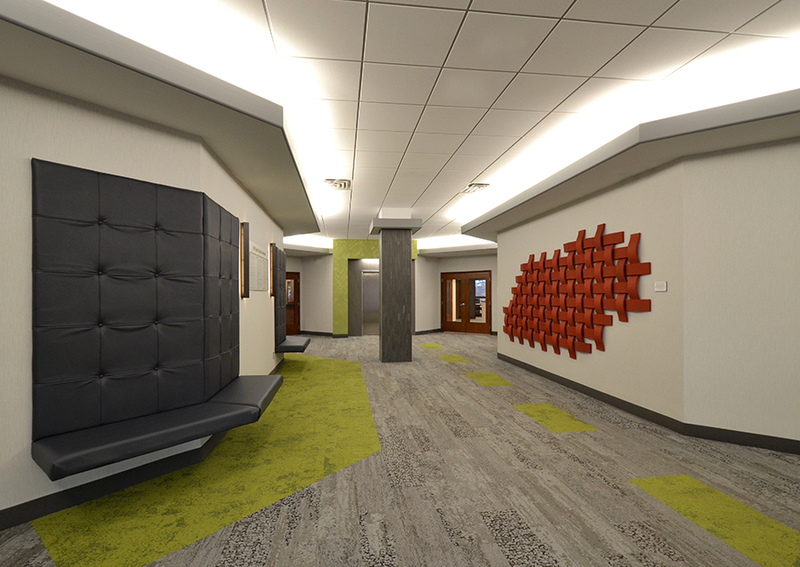 Rosenblum also plans to incorporate the wall tiles into lobby renovations at several of its Wolf Road area office buildings. Click here to read more about The Rosenbum Companies’ use of Ecovative wall tiles in the Times Union.